Our ESL classes offer a unique opportunity to study English while learning about the cultures of students from around the world. Congratulations to all of our students who recently completed classes in Maplewood, Montclair, Passaic, and Paterson. IThe Trump Administration last week released its “America First” budget, a blueprint for fiscal years 2017 and 2018, marking what could be, for advocates of adult education and literacy, a long period of watching, waiting, and hoping. What’s clear is that the draft budget makes steep cuts in nonmilitary spending, including a $9 billion reduction to the Department of Education, slashing its discretionary spending by 13-percent. But there is a lot that is not so clear. “The budget does not mention adult education but that does not mean that the administration does not support cuts in the program,” the Coalition on Adult Basic Education, or COABE, said in a statement. While we wait for news, it’s a good time to stay connected and fortify our network of adult literacy supporters. So if you haven’t yet registered for the Literacy New Jersey “Literacy for Life Conference” on Saturday, April 22, (https://goo.gl/dkrJdf) or NJALL’s annual conference, “We Can Do Difficult Things,” on Friday, May 19 (https://goo.gl/g5ojt6), there is still time. Each features a day full of interactive workshops, seminars, and networking. Lily, right, a student from China, knew little English when she joined LVA. She’s now an advanced student, thanks to her drive and the help of her tutor, Mary Kao, left. Please bring a pair of paper-cutting scissors. Subject matter includes how to design an ESL civics course and what topics to include in the curriculum; and the skills and vocabulary required to pass the U.S. Citizenship reading, writing, and civics exams. If it’s worth having, it’s worth waiting for and no one knows that better than Lily, an LVA student from China who waited two years for help learning English. That was five years ago. Since then, she’s crossed off every goal on her literacy to-do-list and developed a wonderful working relationship with her tutor, a trainer whose mother was never taught to read and write because she was a woman. Lily came to the United States from Shanghai, China, nine years ago with her daughter and her husband, an American with whom she practices English. Soon after her arrival, she became a businesswoman, opening her home music studio to young piano students. Lily teaches about 15 of them, ages 5-12, and they study the music of Beethoven, Chopin, and Liszt, which they in turn perform in recitals twice each year. Her love and appreciation of the arts is deeply rooted in her childhood in China, where it was likely sparked by her nanny, a woman who loved to sing and take Lily, then just a toddler, to shows. Years later, Lily would study classical ballet and Chinese traditional dancing, but she’s no stranger to other forms of dance, including folk dances from India. Lilly, a recently-converted vegan, no longer studies dance but uses it to stay fit, along with swimming, tennis, and taking long walks. “I like to keep my body flexible,” she said. Lily started at LVA as an ESL student with no knowledge of English, and worked her way up to study Basic Literacy, which shifts emphasis from speaking to reading and writing. She’s now an advanced student, and she’s not done. Imagine coming across a sentence in English that reads like this: "Mary apple eats her delicious." For most native-English speakers, the sentence would likely strike you as odd because it doesn't seem to be structured in an order that immediately gets the message across. It has always been thought that, when adults learn a second language, they face this problem because the grammar of other languages doesn't necessarily match their native language. But, a new study reveals that adults are capable of learning and processing a new language in a way that resembles native speaker language use. "Learning a second language as an adult is a difficult task," said UCR affiliate psychology professor Elenora Rossi, who was on the research team. "For years, scientists have believed that only the brains of very young children were pliable enough to allow for successful learning of a second language, while that was thought to be impossible for adults." In the past two decades, the advance of testing methodologies and revolutionary neuroimaging methods have allowed language processing to be studied in real-time in a non-invasive way, opening the doors to a better understanding of how our brains process linguistic information in two languages. 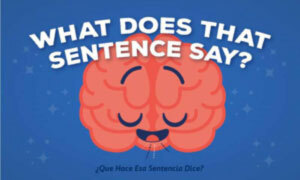 In the study, the team looked at how native English speakers, who learned Spanish as a second language as adults, understood sentences in Spanish that contained subtle aspects of Spanish grammar that do not exist in English. Ted Furrey welcomes adventure. And he has for years, since earning an English degree from Boston College at age 22. After school, he labored as a construction worker on demolition projects in Paterson and Newark, saved his money, and traveled the world. In Italy he bought a car, drove through Yugoslavia and into Greece, where he left it. He took trains and buses through Turkey, Iran, and Afghanistan. But when he and a travel mate landed in Lahore, West Pakistan, they were trapped. In December 1971, East Pakistan, now Bangladesh, was fully engaged in a war for independence with its government partner to the west and Ted found himself in the middle of it. “From the hotel, you could see the bombs exploding,” he said. Another trip Ted vividly remembers came 11 years later. After studying computer programming, he took a job in the IT department of a Bloomfield engineering firm. In 1982, he and his wife, Robin, another programmer with the firm and now an LVA tutor, volunteered for a long overseas assignment in Venezuela. While traveling to a conference on the Venezuelan coast, Ted mistakenly drove through a police checkpoint on a darkening rainforest road and was pulled over. Robin remained in the car as machine-gun toting police took Ted to a hut in the bush. They accused him of speeding, failure to stop, and demanded that he pay hundreds of dollars in cash or give up his car. As Ted struggled to negotiate in Spanish, a Colombian co-worker enroute to the same conference pulled up and helped interpret. The fine was reduced from $700 to $70.